Spring is a great time to hit the road and take a weekend trip. With hundreds of great spots to explore just a short drive from Phoenix, a road trip is just the thing for finding a new adventure. Before the summer starts heating up, it’s also a good time to get out to some off-the-beaten path locations like the colorful spectacle of Salvation Mountain and the surrounding Salton Sea area in Southern California. Much has been written about California’s largest lake, which also happens to be man-made. Caused by accidental flooding on an Army Corps of Engineers project in 1905, water from the Colorado River filled in the lowland of an area known as the Salton Sink. The resulting lake in the middle of the Sonoran Desert has seen many things since its relatively short life. The Salton Sea remained under most people’s radar until the 1950s and 60s when a major push occurred to develop the area as a waterside resort. Thriving vacation communities sprung up alongside the shoreline for a few decades, where boating, fishing, swimming and sunbathing were the featured activities alongside a variety of wildlife and migratory birds that called the area home. Sadly, the boom times for the Salton Sea were short lived. Land-locked and arid, the Salton Sea area doesn’t experience enough rainfall yearly to replenish the water it loses to evaporation. The ecology of the area began to deteriorate with overuse, and the Sea still struggles to maintain and environmental balance for its unusual circumstances. However, tourism has never left this unusual location, but it has taken on a quirkier feel than the yacht clubs of the past. Visitors to the area are treated to a Banana Museum, a field of unusual “mud pots” bubbling up from the ground, and, of course, Salvation Mountain. Some of the most unusual spots in the Salton Sea exist around one of its oldest settlements, the town of Niland, California. Just outside this town which sprang up with the creation of the lake is an unusual off-grid RV park called Slab City which lie just in the shadow of the sprawling Salvation Mountain site. Salvation Mountain is a hill-sized, rainbow-colored spectacle. Artist Leonard Knight worked and lived on Salvation Mountain from 1984 until near the end of his life. Crafted from adobe and strawbales coated with latex paint, Salvation Mountain features rough-sculpted rivers and flowers running down a hillside that proclaims “God Is Love” in giant red letters. While Knight is no longer alive to guide and greet visitors, Salvation Mountain is still open to the public and maintained by a group of volunteers. To keep up the bold and unique visual appearance of the artwork, even as it is exposed to the harsh desert sun, those who work on it are always looking for donations of lead-free latex house paint. There’s plenty to explore on the site, from Knight’s decorated trucks to his experiments with building with wood and found objects. Getting an up-close look at his visionary work is a feast for the eyes. Rugged travelers may want to travel a little further down the road to Slab City. Although this “Last Free Place In America” may be intimidating for many tourists, it has a bar, weekly open mic performances and even a small hostel. Slab City is at its most welcoming in the Winter when the area is inundated with snowbird RVers. 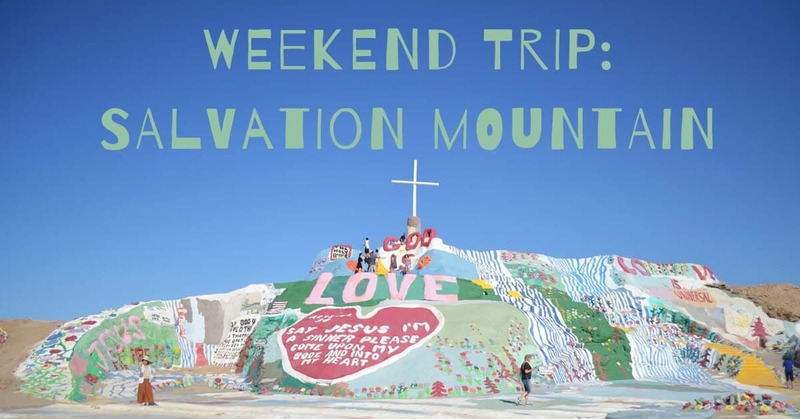 For a weekend trip to the Salvation Mountain, lodging is available in the Salton Sea area or further down the road in the Anza Borrego Desert State Park. Around the Salton Sea, try one of the natural hot springs resorts for an affordable, relaxing stay that takes advantage of the geothermal heat below the desert’s surface. For those wishing to catch some real desert flowers after seeing Salvation Mountain’s technicolor adobe flora, the vast Anza Borrego State Park is a short drive down the road. Known for its Springtime sweeps of wildflowers, the charming resort town of Borrego Springs boasts numerous hotels, resorts and motels for the traveler. Beautiful camping opportunities also abound in the park for the thrifty traveler. One of the best parts of travelling is coming back to your beautiful desert home. This season, make a commitment to protect your home’s comfort and beauty with CC Sunscreens, an attractive and affordable way to reduce your energy costs and protect your home from sun damage. Want to learn more? Contact CC Sunscreens today!